Golf is a sport full of rules and etiquette – and that applies to what you wear on the course as much as the game itself. Personally I like the fact that dress codes apply and I think it adds to the experience of being part of a Club and of playing a course where standards matter. Inappropriate attire just sort out of stands out doesn’t it? But it’s so important for the future of golf that younger players are attracted to the game, and that begs the question – how relevant is a ‘one size fits all’ dress code when you have (or are hoping to attract) players in their teens (or younger) as well as players in their 30s, 40s, 50s (and older)? There are variables to all of the above, particularly according to how conservative/traditional the Club – and how good a golfer you are. 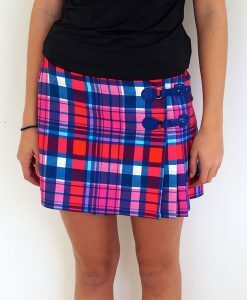 We regularly see very low handicappers in tournament play in very short golf shorts and skirts and many look great in that gear, but the average golfer runs the risk of being shown off the course if they turned up in something similar. Is it time to call time on this double standard and see greater leniency for the average club player as well? Or at least to narrow the divide? Returning to my original point, is it really necessary for young players to be told they have to wear skirts and shorts that no self-respecting teen would be seen dead in? Isn’t that just reinforcing that image of golf as a bit old and fuddy duddy? Perhaps it’s time for the mandated skirt/short length to be put to bed and the alternative of simply ‘smart golf attire’ to be brought into the dress code. Is this going to lead to a deluge of sixty year olds channelling 1970’s hot pants? I don’t think so – most women golfers are savvy enough to know when it’s time to lovingly pack away the mini, but having said that, it’s quite possible to look good in shorter or longer hems irrespective of age – it’s a question of what suits you. We want to keep a certain ‘standard’ as part of the golf wear code and there’s certainly a challenge in setting out objectively what ‘smart’ golf wear constitutes, but you’ll see far worse tragedies on the golf course in terms of bad colour combos and styling, in my view, than a woman golfer in a skirt that doesn’t quite reach mid-thigh.